Nothing is quite as depressing as a dark room. 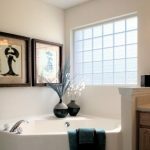 If you have a room in your home that lacks sufficient natural light, you can take steps to brighten it up. With a few tweaks, your room can feel warm and inviting again. If the room has outside walls or a ceiling with access to the attic and roof, adding windows or a skylight is one way to add light. Always check the structural integrity of the wall before cutting into it so you do not cut a supporting beam. If you have extra space, adding an additional window or two can make a huge difference in the amount of light in the room. 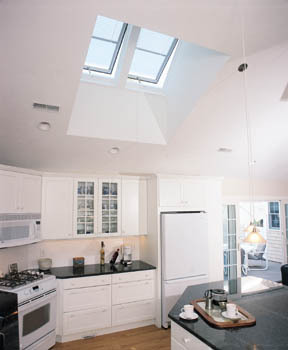 For interior rooms, where windows won’t work, adding a skylight may be a solution. Only tackle this job if you are confident in your abilities to measure and install carefully. To begin, use a stud finder to access the main beams, and choose a location between these to cut the drywall. Cut the appropriate sized hole in the drywall, then use a level to mark the exact opening on the underside of the roof. Mark the corners of the rectangle using screws, which push through to the exterior of the roof. Now, head to the the roof and use those screws to mark the shape of the light on the top of the roof. 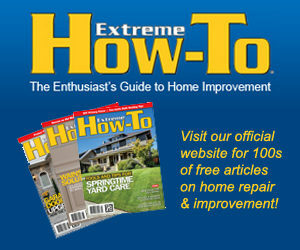 Use a saw to cut through the shingles and plywood. At this point, you have your hole. Save the shingles for later use. Install the skylight according to the manufacturer’s instructions. Re-install the shingles, starting from the roof’s lowest point and working up, nailing flashing next to the skylight before installing each shingle. If needed, cut shingles to fit flush against the skylight. Add joint sealant on any exposed nails to prevent leaks. Now that the hole is sealed, head back inside and seal the cavity. Build a drywall frame to close the edges and create a path for the light to enter the room. Add insulation to the attic before installing the frame. Install, mud and paint the frame, and the project is done. If that process is too involved for your skill level, tubular daylighting devices are an easier option. These are like miniature tubular skylights, and they do not require extensive drywall work to install. Sometimes the room cannot have natural light added. Glass doors between a dark room and a well-lit room let some of the light spill into the dark room. They give the dark room a feeling of openness and make it seem larger than it really is. If privacy is a concern, a sheer curtain over the door will allow some light to filter in without giving full view of the room. But for rooms where privacy is not a concern, leaving the glass curtain-free will make an even greater difference. Adding lighting in a dark room may seem like a logical step, but the type of lighting you add can make a tremendous difference. Throwing a lamp in a dark corner will help that corner, but it will not do much to brighten the entire room. For areas such as basements, where doors and windows can’t help, lighting is the key. Recessed lighting or track lighting put multiple sources of light in the area and brighten dark corners. Track lighting is easy to install if you have an existing light fixture in the same location. Turn off electricity to the area, then remove the old light fixture. Next, install the mounting plate where it was. Secure the track to the ceiling using the manufacturer’s instructions. Wire the track to the wires from the old light fixture carefully, then install the lights according to the manufacturer’s direction. With track lighting, you can aim the light wherever you need it, even aiming the different fixtures on the track in different directions, to brighten up the room. After installing the lighting, choose your light bulbs carefully. Daylight-balanced bulbs can create the feeling of sunlight where none is present. A mirror can reflect light and bounce it into the room, but it needs to be hung in an appropriate spot. Choose a spot that will allow the lighting in the room to bounce off of the mirror. The ideal placement is either opposite or perpendicular to any natural light source. As a bonus, reflective surfaces make small spaces look and feel larger than they are, and this can help prevent the confining feeling you get in a dark room. Darryl Crosby is a home renovation blogger and the Senior Director of Marketing at Case Design/Remodeling, Inc. Darryl loves to write on home improvement and remodeling projects, as well as providing tips for designing your home just the way you want it.